In addition to brewing a great pot of coffee into a standard glass carafe, this unit will also make a single mug of coffee from K-Cups or coarse ground coffee. Whether you're preparing a pot for the house or need a single cup to get on the road, this coffee pot may be a great unit for home or office. In this Hamilton Beach 2 Way Flexbrew review we will look at its features and specifications, how it performs, and its pro’s and con’s to help you decide if this unit is right for you. Changed your mind? Check out other Top Rated Coffee Makers here. Disclaimer:​ This review was not sponsored or paid for by Hamilton Beach Brands, Inc. We used our own hard earned money to purchase this unit and review it to help our readers make an informed buying decision. Opinions expressed are our own. The FlexBrew gives you the chance to make a quick cup for one person or a full carafe for many guests. The single cup dispenser features a metal filter for coarse ground coffee or a K-Cup pod holder insert. This side of the coffeemaker allows you to brew into a tall mug, or offers a shelf to hold a mug for single cup. Our 7" tall travel mug just fit and brewed coffee without splashing. There was a bit of splashing using a large coffee cup. 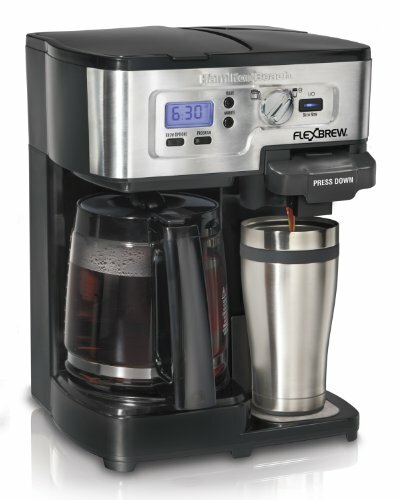 The carafe side of the Hamilton Beach FlexBrew lets you brew a standard pot of 12 cups of coffee. Thanks to the pause and serve feature, you can remove the pot, fill a cup, and replace the pot so it finishes brewing into the carafe. Once brewed, the burner will shut off after two hours to avoid the risk of scorching or fire. This unit is programmable and will make coffee of regular or bold intensity, depending on the setting you choose. Investing in a 2-way FlexBrew coffeemaker gives K-Cup fans the chance to brew exactly to their preference, while those who like to linger over a pot of coffee can still enjoy the benefits of a full-size pot. You can see more of Kendall's work here. It's a multi-purpose device! Fans of hot beverages made with K-Cups such as hot cocoa or cider will appreciate being able to quickly make their favorite beverage in addition to coffee. If K-Cups aren't your thing but you only need 1 cup of coffee, you can still make it using the filter unit on the single side. It's efficient in that you can brew one cup in a rush or a whole pot at your leisure. The "pull and pour" option on the carafe side can speed up your coffee dispensing options, and the auto-shutoff after two hours can save you worries. You can program not only the brew time but the flavor intensity. The carafe side allows you to brew coffee with regular or bold flavor with a press of a button, and you can make a more intense cup on the single serving side by reducing the amount of water you add. This saves you the bother of having to buy multiple styles and roasts of coffee, although coffee purists will disagree. The water sensor can be tricky, especially if mineral buildup has occurred in the machine. Our proactive approach: If you're brewing a single cup, fill up the reservoir with the cup you plan to drink out of; then there's no risk of spilling or overflow. The settings on this machine are particular. Because you're working with two different water level outputs, be very careful in your programming and set up to make sure you're brewing on the correct side. There are multiple plastic parts on the Flexbrew and it's possible to have a plastic smell or taste the first few times you use it. A simple fix may be to run the machine a few times adding extremely hot water to the reservoir to purge the plastic smell. We ran 3 pots of water through the machine just to help break it in, and had no issues with it. If you have an issue that won't go away, the wisest move would be to contact the seller and either get a replacement or get your money back. Don't drink plastic smelling or tasting coffee. This machine is fairly quiet when brewing a carafe. There is a bit more noise when brewing a single cup​. The brewing cycle seems to have phases to really maximize the brew and thus creating extra noise. Carefully review the contents of the box; the 49983S has a travel mug included, the other units don't. When you fire up the single serving side, the burner under the carafe will get hot. While this is listed in the instructions and the warnings, it's easy to forget. This burner will turn off as soon as the single side brewing is done, but you'll want to move your carafe off the burner to avoid burning it. Read the instructions! This unit has an auto-shutoff to make sure the single brewing side doesn't dump 12 cups of hot water all over your kitchen while you're trying to brew a single cup. If the water reservoir is overloaded, the machine will give an error code under normal conditions. To help reduce mineral build up, which increases maintenance, consider investing in a water pitcher or filtration unit. This machine will work with K-Cups (the single use version, not re-usable K-Cups). The way the mechanism works, we didn't test using our refillable K-Cup. Besides, there is no need to since this unit also comes with a single cup filter basket. It should be pointed out that the mechanism to lock down on the K-Cup is a bit different than you'll find on Keurig models. Placing the K-Cup into the machine won't puncture the top of it, it punctures the bottom. What Do The Flexbrew Model Letters Stand For? The 49983 refers to the dual sided coffeemaker that offers a carafe on one side and the K-Cup dispenser beside it. We we able to buy the 49983C​ and have used it for our review. The 49983 and 49983A and 49983C are the same units. We believe the 49983C is meant for for Canadian consumers while the A is for American consumers. The 49983S is a 49983 with a permanent gold tone filter and a travel mug in stainless steel, perfectly sized for the K-Cup dispenser. Any time you combine heat, water, coffee grounds and electricity you're at risk for a mess until you've learned how to handle the machine. Because there are two different amounts of water that can be dispensed, it's critically important that you review the features of the machine and follow the setup instructions. The unit is programmable both for time of brewing and intensity of coffee flavor. Because the two different sides of the machine use markedly different amounts of water, following the preparation instructions to the letter will greatly reduce your risk having to clean up a lake of hot water and coffee grounds. If you filled up the water reservoir and hope to brew a single cup, the over-fill sensor will likely be activated and the machine will shut down on you giving you "ERR" code on the screen. To correct this, you'll need to brew a full pot, drain the reservoir, and start over on your single cup. The easiest thing to do in the future is to fill the reservoir with water from your travel mug. The process of combining a standard coffee carafe and a single serving machine is a great idea and offers coffee drinkers plenty of options. While Hamilton Beach is an organization that has been around since 1910, they continue to push the envelope and embrace new technologies and new tools for the kitchen. The 2-way FlexBrew coffeemaker may be a little touchy to program and use at first, but the convenience cannot be denied.​ We like this coffee maker a lot, but we wish we had gotten the S model which includes a travel mug. You can never have too many! What do you think? Let us know in the comments with your thoughts.